This site gets many request from time to time from readers by way of contact form or in the comments section for simple remedies for finding their misplaced or stolen things. 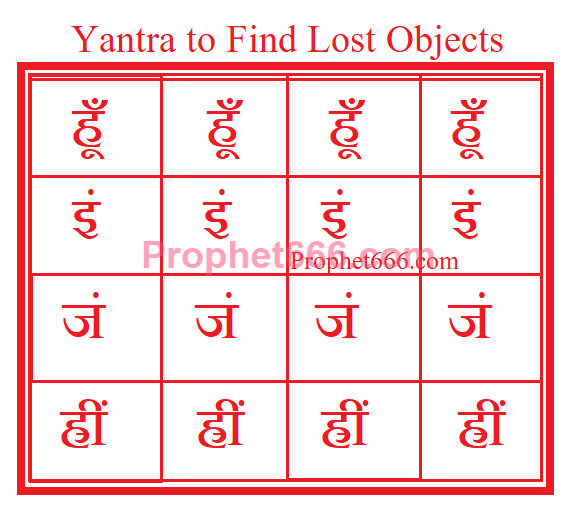 These readers might find this paranormal Yantra Remedy helpful in recovering their lost property. The Yantra shown in the image below has to be drawn on white paper with either Ashtagandha or Kumkum paste as the ink. This paste should be prepared by adding a few drops of water to the Kumkum or Ashtagandha. A pointed bone of a goat should be used as the pen. This Yantra has to be drawn sitting under the shade of a Red or Yellow Kaner Tree, called in the English language as the Oleander Tree. The two recommendations given above are essential to this Yantra Remedy and there are no alternatives for them. Once the Yantra is prepared, it should be kept on the body, in the pocket or purse. This is said to help find the lost object quickly. 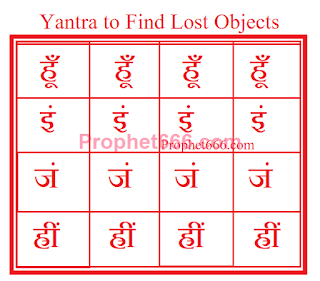 Notes- This is a standalone Yantra Remedy and there is no need for any kind of Mantra Infusion or any other Tantric or religious ritual associated with the making and use of this Yantra. It can be prepared on any day and there is no need to wait for an auspicious occasion for preparing the Yantra. You can also browse the other sections of this site for paranormal remedies for related purposes, like finding the names of thieves or finding a lost animal. खोई हुई ,चोरी गई ,हाथ से निकल गई,वस्तु,धन,पशु आदि मन्त्र प्रभाव से वापिस प्राप्त हो जाते हैं .इनका गायत्री मन्त्र भी है --कार्तवीर्याय विद्महे महावीर्याय धीमहि तन्नोऽर्जुनःप्रचोदयात् .रात्रि में इस अनुष्टुप् मन्त्र का जप करने से चोरों का समुदाय घर से दूर भाग जाता हैं । इस मन्त्र से तर्पण करने पर अथवा इसका उच्चारण करने से भी चोर भाग जाते हैं .